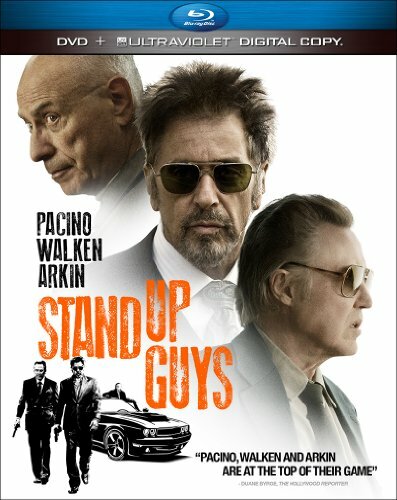 Academy Award(R) winners Al Pacino, Christopher Walken and Alan Arkin star in Stand Up Guys arriving on Blu-ray Disc (Plus Ultraviolet Digital Copy), DVD (plus Ultraviolet Digital Copy) and Digital Download May 21 (with an early Video on Demand Window Beginning May 7) from Lionsgate Home Entertainment. Hollywood legends Al Pacino (The Godfather), Christopher Walken (Catch Me If You Can) and Alan Arkin (Argo) star together on the big screen for the first time in Stand Up Guys , arriving from Lionsgate Home Entertainment this May. The action comedy about three ex-gangsters who reunite for one unforgettable evening, will be available May 21 on Blu-ray Disc (plus Ultraviolet Digital Copy), DVD (plus Ultraviolet Digital Copy) and Digital Download. Stand Up Guys will also premiere on Video on Demand on May 7, two weeks prior to its Blu-ray and DVD release date. Directed by Academy Award(R) winning producer Fisher Stevens (Documentary Feature, The Cove, 2009) and co-starring Golden Globe(R) winner Julianna Margulies (TV's "The Good Wife), the tough but touching film centers on three retired gangsters who reunite for one epic final night. However, one of the friends is keeping a dangerous secret - and his time to find an acceptable alternative is running out. As the sun rises on the guys' reunion, their position becomes more and more desperate and they finally confront their pasts once and for all. Filled with enlightening bonus materials including deleted scenes, audio commentary and numerous featurettes that look at the "making of" the film, the stunt driving sequences and the Golden Globe(R) nominated music from Jon Bon Jovi, the Stand Up Guys Blu-ray Disc and DVD will be available for the suggested retail price of $39.99 and $27.98, respectively. Title Copyright: Stand Up Guys (TM) & (c) 2012 Lakeshore Entertainment Group LLC, Kimmel Distribution, LLC and Lions Gate Films Inc. Artwork & Supplementary Materials (c) 2013 Lions Gate Entertainment Inc. All Rights Reserved.